It's been ages since I last used a liquid eyeliner. Over the years, I've become more of a gel and pencil eyeliner kind of girl. They are the ones that are more in my comfort zone because quite frankly, I sometimes find liquid eyeliners intimidating to use. Even so, I really do love the effect that liquid eyeliners give. The crisp, sharp line, and the rich pigment, all make a gorgeous impact on an eye look. Well, I finally decided to break out of my shell and give liquid eyeliners another go. I am much more comfortable now with my eyeliner application method so, it seemed like the perfect time to try my luck with a liquid eyeliner. I ended up purchasing E.L.F. 's Waterproof Liquid Eyeliner Pen in black ($1.00) not only because it was affordable but, I liked that the pen contained a felt-tip instead of a brush applicator. I figured that the felt-tip would be much easier to work with. And lucky for me, it was! I have to say, thanks to E.L.F. 's Waterproof Eyeliner Pen, I think I am gaining an appreciation for liquid eyeliners, again. This eyeliner pen is simply amazing. It contains a pleasant formula, which has rich pigmentation and as I suspected, the felt-tip does wonders at easily creating a thin or thick-depending on your preference, precise smooth line. For a thin line, apply with the very tip, and to obtain a thicker line, use the sides of the felt-tip. I didn't find the felt-tip to be rough at all on my lid, which was nice. Also, I love how quick the eyeliner sets. It dries almost instantly so no worries about color transferring on the lids, here. The lasting power is pretty impressive. That is, with an eye primer applied beforehand. I tried this eyeliner on my bare, oily lids without a primer and, it faded and almost disappeared, within two hours. But if your lids are coated with a thin layer of eyeshadow primer, the liner isn't going to go anywhere. It will stay in place all day. As for the waterproof claim, I think I am going to have to disagree with it. Based on my experience, when in contact with water, the liner color had faded and started to migrate, a bit. It definitely didn't hold up. The removal process is a cinch with this liner. Eye makeup remover does the trick just fine, with very little effort. 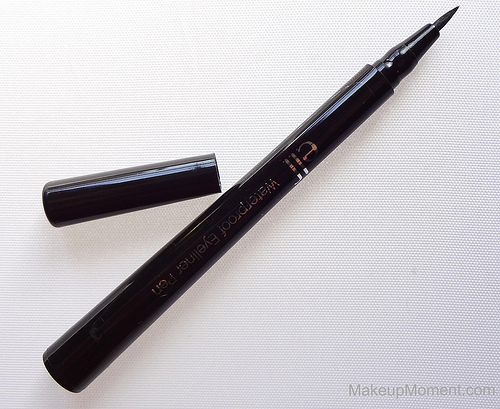 Overall: I think this is a great affordable liquid eyeliner that many can enjoy. 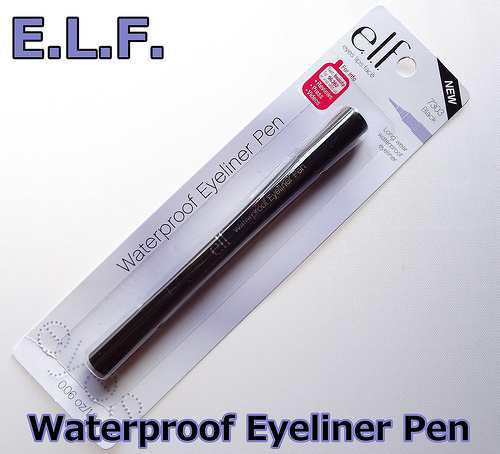 If you are an eyeliner novice, I am almost certain that E.L.F. 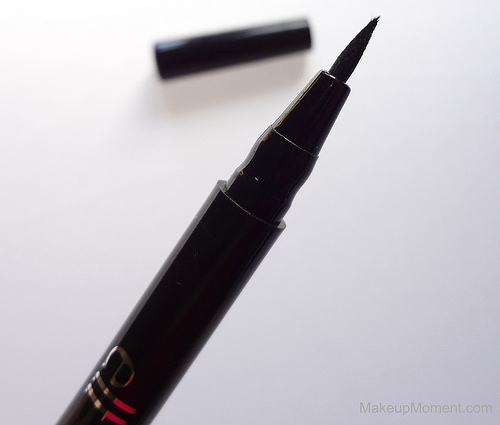 's Waterproof Eyeliner Pen will aid you well, when it comes to application. It's very user-friendly. The fact that this liner wasn't waterproof for me doesn't put me off, one bit. I didn't buy this product for the waterproof aspect. This eyeliner has other great qualities to it, that are far more overpowering, I think. Since I have had this liquid eyeliner, I have been giving my cream eyeliners a little rest. I have truly enjoyed using this product and I most definitely intend to keep on repurchasing. I have my eye on the more colorful E.L.F. Waterproof Eyeliner Pen shades, for next time. I can already imagine how stunning the colored shades will look. What do you all think of E.L.F. 's Waterproof Eyeliner Pen? 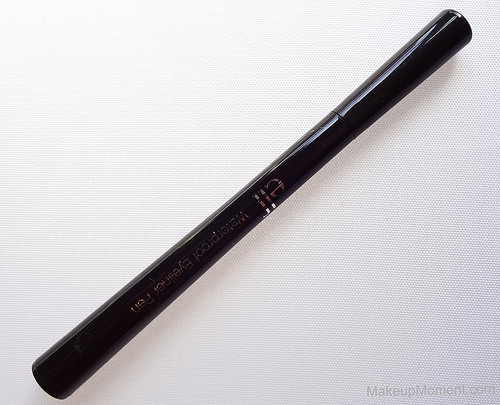 Which are your favorite liquid eyeliners? Freaking E.L.F.! Love them! How have I not tried this liner yet? It weird because I bought one of these & it dried it in about a week, & the tip was frayed. Weird! My favorite liquid liners are the Marabella Permanet Eyeliner, KPalette 1 Day Tattoo, & Jordana FabuLiner! maybe I should try this again! Tried this once and it dried out so fast but it worked great before!